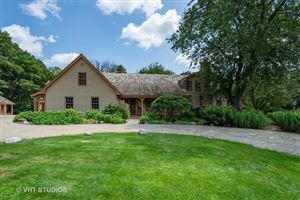 Magnificent Barrington Village home! Brazilian hardwood floors throughout this open concept layout ranch home, living room with gas fireplace, cathedral ceilings; custom kitchen with granite, Thomasville soft closure cabinetry, SS appliances and oversized island; Master Bedroom includes double vanity bathroom, whirlpool tub, separate shower, private entry to patio & walk-in closet. All Marvin Custom Windows and doors, California closets, indoor outdoor surround stereo connection, basement features additional family and rec room. Gorgeous backyard with wood burning fireplace, stone patio and gardens galore!